Here is the latest, sorry for the hiatus, things have been busy around here and I spend most of my days outside with my boys. This is a sketch done with Micron ink black #5 pen in my Moleskin sketchbook. It’s of a bicycle I picked up on the side of the road for free which the boys argue over. 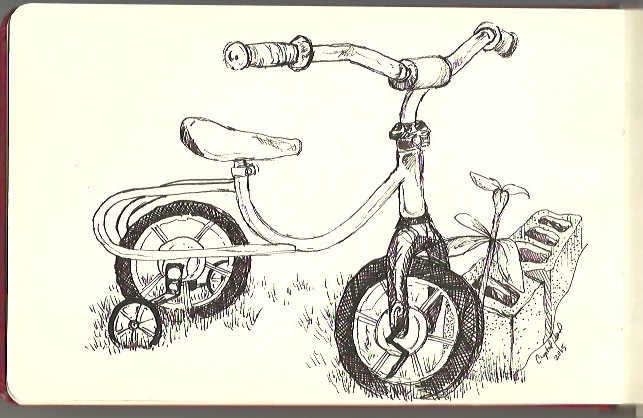 It has no pedals, and they can barely reach the ground, but it’s still favored. I can see the obvious mistakes, but the fact that I even got ten minutes without interruption to sketch is a miracle, so I’ll take it. I may finish it out by adding more cinder blocks (which edge our garden) and maybe something in the background. Unsure yet. Enjoy! Beautiful representation. And further proof that one person’s trash can really be someone else’s treasure.